I am blessed to work with a gifted team of theologian-writer-musicians at Clear Creek Community Church who share the same passion to see music for the church by the church. It seems to me we may be entering a wonderful season of worship music produced by the local church. Not content to leave it to Nashville or the “Christian Music Industry” to provide songs for God’s people to sing, I’ve seen scores of churches I’m personally acquainted with who have created songs for use within corporate worship. 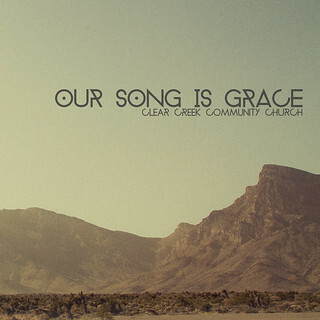 This weekend, my church will add to that growing catalog with their latest EP Our Song is Grace. These songs were written to coincide with and be shaped by our new message series in Exodus. If you want to purchase the new album, Our Song is Grace, from iTunes, click here. As I mentioned, there are many churches who seek to bless other congregations with wonderful resources concerning worship music, this is simply one way CCCC has chosen to be involved.